PHOENIX (CNS) — The new year will be a brighter beginning for Terrance Alston. The 49-year-old, who spent enough years on the streets, is now fixing up his own home and mending family bonds. He attended his first big family dinner in 20-something years over Christmas, just days after moving from Phoenix home to Philadelphia. The move meant starting over again, but Alston has cleared such hurdles before. He gained sobriety nine years ago. Last year, he began rebuilding his resume and his health. Alston credits St. Joseph the Worker for rallying him through the process. The nonprofit, founded as an outreach of Andre House, a Phoenix homeless shelter and soup line, offers resources to help clients transition from homelessness to stability. Alston suddenly had access to job leads, computers, bus passes, phones and a wardrobe for interviews and jobs. Five weeks later, a friend got a job preparing wood to become furniture. Alston applied at the same time, but he didn’t receive a call back. “I have the same qualifications as he does,” Alston reminded his prospective employer via phone. The employer said that if he could get to the site in a relatively short amount of time, the job was his. St. Joseph the Worker connected him to St. Vincent de Paul Society’s Shifting Gears program. It provides a free bike to clients in need of transportation for work. That’s all it took. Alston got hired and within two months, had saved enough money to rent an apartment. While there for about 16 months, he re-established contact with his family. Alston said his stubbornness and ignorance had kept them apart. 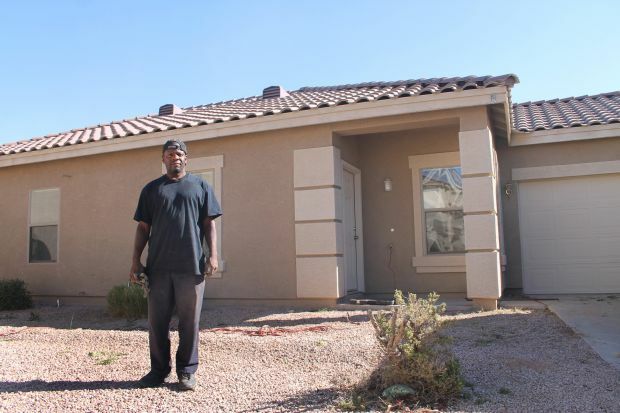 “My sister even noticed the change in my demeanor over the phone,” Alston told the Catholic Sun, newspaper of the Diocese of Phoenix, during a short break from maintenance work on a vacant home in Chandler, Ariz.
She was so impressed with the transformation — they hadn’t connected in 22 years — that she rented him a home near hers in Philadelphia and had a job lined up when he got there. Alston, who has also battled back the threat of diabetes, plans to pursue that job with the idea of medical assistant school on the horizon. Family reunification is not an uncommon result of the work of St. Joseph the Worker, according to Daren Strunk, an employment outreach specialist. The agency often receives phone calls from family members of clients who are eager to support its mission, he said. Alston, who repeatedly describes himself as “incredibly blessed,” is one of 925 success stories staff and volunteers at St. Joseph the Worker could tell from the last fiscal year alone, said Brent Downs, executive director of St. Joseph the Worker. The nonprofit, now in its 25th year, is amid a campaign to create a mobile unit. The custom-fit motor home would bring St. Joseph the Worker’s resources — a computer, resume and interview strategies, clothing and tools for the job – to homeless clients anywhere in the Phoenix area. The staff considers it an expansion of the services two outreach specialists have been offering at 20 satellite locations for the past year. They spend the workweek on the road helping clients of homeless and transitional shelters to present themselves as employable. Downs envisions parking the mobile unit in church parking lots and inviting clients of area agencies to visit. Right now, the outreach specialists set up shop at one agency for as few as eight and as many as 100 clients. It’d be more efficient to have a permanent office set up and clothing closet in the mobile unit that can travel, he said. Alston said he hopes it would raise awareness, too. St. Joseph the Worker’s resources helped him regain stability just as much as staff encouragement did. That self-confidence can make all the difference. “People need to be encouraged because they don’t exactly come in here on a winning streak,” said Strunk during office hours at a transitional facility for recovering addicts. St. Joseph the Worker also assists inmates transitioning out of prison. Strunk said they all want the fast track to a job. The quickest path he has found requires clients to swallow their pride and sometimes take jobs that are below their capabilities as a steppingstone. Strunk downplays the staff’s role. Hammel is a staff writer for the Catholic Sun, newspaper of the Diocese of Phoenix.